Will the November OPEC Meeting Fail? Subject: Will the November OPEC Meeting Fail? The November OPEC meeting is tomorrow and the stakes are high for the entire energy sector. At this week's meeting, the cartel will try to reach its first official production agreement since 2008 in a bid to raise global crude oil prices. At the September OPEC meeting, the cartel surprised the world by announcing it had reached a tentative agreement to cut oil production and drive up oil prices. Within a week, oil was trading above $50. However, investor optimism was short-lived. 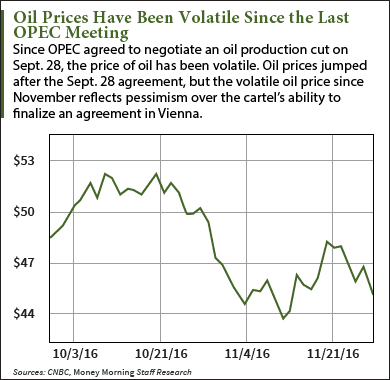 The cartel's announcement in September was just an agreement to discuss a production cut at the November OPEC meeting. The specifics of a production cut hadn't been decided. And the news around these negotiations has shown an agreement is farther away than many hoped. The 14 member countries of OPEC are responsible for producing 40% of the world's oil. With that amount of production, OPEC can drastically affect oil prices. As long as the 14 members of OPEC – and any other countries that agree to go along with their plans – stick to their agreements, the cartel has the ability to manage global oil prices. OPEC can flood the market with oil to drive down prices, or contract oil production to reduce supply and drive up the price of oil. Due to an ongoing oil supply glut, WTI crude oil prices hit a 10-year low of $34.55 per barrel at the beginning of 2016. This oversupply of oil is what OPEC is trying to combat at its November meeting. The chart below shows how important OPEC is to oil prices. After its Sept. 28 meeting, oil prices jumped as investors were optimistic the cartel would better manage the supply of oil and increase prices. As the specifics of the agreement have been negotiated ahead of the November OPEC meeting, oil prices have gotten increasingly volatile as investor optimism has turned to pessimism. What Changed Since the Last OPEC Meeting? The reluctance of some countries to go along with an agreement has had a domino effect, stirring up rivalries between member countries and leading important partners, like Russia, to take a wait-and-see approach. There have been four major problems standing between OPEC and an agreement. The first problem after the Sept. 28 meeting was a huge increase in oil production by cartel members. Since a production freeze was expected, cartel members tried to get as much oil to market before they would have to cut back. Libya doubled its oil production in the wake of the meeting, while the IEA announced in October that OPEC oil production had reached a record 33.64 million barrels a day. The trouble is OPEC had hoped to cut production down to 32.5 million barrels a day. With OPEC members increasing production, the figure became more difficult to reach. The second issue for OPEC is the election of Donald Trump to the presidency of the United States. While the U.S. is not an OPEC member, it's the world's largest oil producing country. And Donald Trump has vowed to lessen regulations and restrictions on oil production. The possibility the U.S. might increase its oil production means even if OPEC reaches an agreement, it might not be enough to boost oil prices. The third problem is some cartel members are requesting exemptions from the agreement. Iran first requested an exemption from a production cut because it was in its first year of production after international sanctions against it were lifted. This led Nigeria, Libya, and Iraq to also request exemptions. Iraq and Iran are two of the top three oil producers in OPEC (behind Saudi Arabia), and they are also geopolitical rivals. With both countries demanding an exemption as long as the other was given one, the possibility of a final agreement got further out of reach. Both Iraq and Iran have issued hollow statements about their support for a plan. For instance, on Monday the Iraqi oil minister said, "We are optimistic. We hope we (will) have an agreement." But, as Bloomberg reports, "high-level" talks between Iran and Iraq before the Vienna OPEC meeting haven't made any progress toward an agreement. The fourth problem is Russia is no longer an eager participant. Russia, the world's second-largest oil producer, initially signaled it would go along with OPEC's production cut, but has grown reluctant since then. Russia now says it might only freeze its production, and only if OPEC comes to an agreement first. Russia was initially planning on attending the OPEC meeting in Vienna, but has now declined to attend altogether. Instead, ministers from Algeria and Venezuela went to Moscow this week in hopes of keeping Russia on board. OPEC also cancelled a meeting with non-OPEC producers scheduled for Nov. 28 because Saudi Arabia said the cartel needed to come to its own agreement first.